Wireless Epee sports fencing equipment is here! There's a real sense of freedom when you dispense with spools and cables. The experienced epee sport fencer can find new ways to move and improve. Novice fencers can appreciate the simplicity of wireless connection.This is now the recognised global option in epee fencing equipment. The low cost of Epee Hitmate allows clubs to provide more active pistes at one time, increasing the opportunities for training and practice, and enables individuals to have scoring equipment for private use. Lose the spools and have it all! 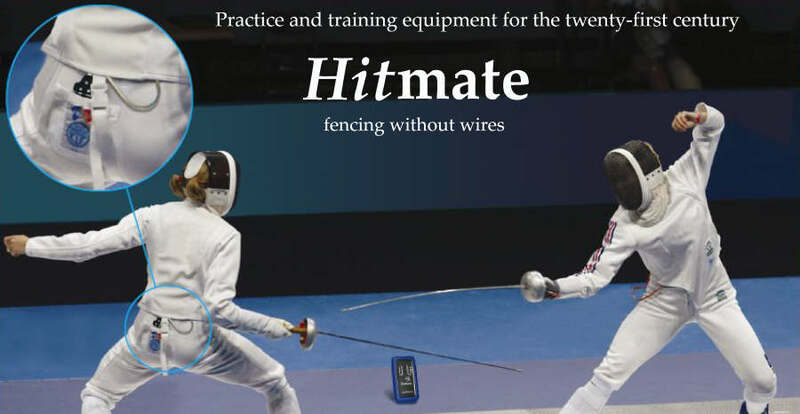 Hitmate implements all the timing conventions for lockout, simultaneous hits and debounce periods, and does not indicate a hit when the weapon tip makes a touch to the opponent's guard or a metal piste.Hitmate is now being used in fencing clubs around the world for both International epee fencers plus children and beginners fencing. Mini Hitmate is now available and is perfect for schools, fencing for children, and fencing clubs. See our Mini Hitmate on the products page. "I have today received the Hitmate I ordered last week. Very quick delivery and a fine and perfect item. I will recommend you to my friends and all who ask about the Hitmate epee fencing equipment"